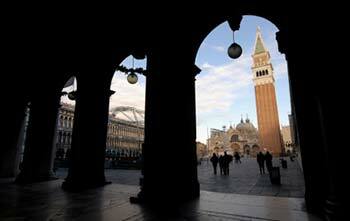 ABOVE: A view of the Piazza and Campanile di San Marco from the arcades that surround the square. The Piazza San Marco, or St. Mark's Square, is one of the world's great squares. It's also a honeypot for swarms of daytrippers and other tourists, but don't let that bother you: The square is vast, the crowds are good-natured, and backpackers coexist peacefully with the well-heeled tourists who enjoy overpriced drinks and orchestral music at the café tables. From fall through spring, the square and the neighboring Piazzetta occasionally resemble a wading pool as acqua alta storm tides force pedestrians to put on boots or keep their feet dry on elevated walkways. The flooding doesn't last long, so if you see the waters rising, put on your wellies or come back when the tide recedes. Don't picnic or sunbathe on the steps in the arcades that surround the square, or you'll be shooed away by enforcers from the city government. If you have time and money to spare, consider visiting the Campanile or bell tower, the Torre dell'Orologio or clock tower, and the Museo Correr beneath the banner at the arcaded end of the piazza. Top photo copyright © Velsilvio.